Chewing the sticky foods will bend the wire. Chewing hard foods will break the brackets, bands or the wire. You need to remember, we create a lot of pressure when we chew our food. The wire on the left is a straight wire. The wire on the right has been severely bent by chewing hard foods or gum. When it comes to chewing gum, a lot of orthodontic patients chew gum while they have their braces. The child will sometimes say, “I’ve chewed a lot of gum and I didn’t break any of my brackets off.” It is true, you may not have knock any brackets off. However, gum chewing bends the wire. I’d like to explain why chewing gum is not good for your treatment with braces. First, it bends the wires. 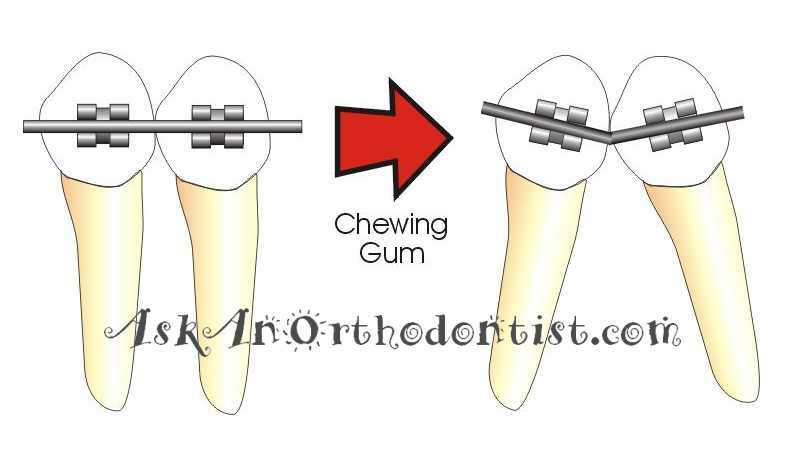 If a straight wire is placed into the mouth to move the teeth and you chew gum, you can bend the wire severely. If the wire is bent, then the teeth move to that bent wire. Then, when you come in for your next appointment, the orthodontist will see the teeth are still not corrected and place another wire. If you chew gum, you will lengthen your treatment time with the braces. Also, as the teeth get straighter, less pressure is needed to move the teeth. But, if you chew gum, all the time, your teeth will hurt longer because you keep moving the teeth into unexceptable positions. Your Orthodontist will continue to apply pressure to move your teeth back. Therefore, you may have more discomfort than usual. Can I chew sugarless gum while I have braces? The answer is no. A patient should not chew any type of gum while braces are in place. It does not matter what type of gum you are using. Gum bends the wire. So, be careful with your braces. You may find that by abiding to the Do Not Chew List, that your treatment will be less painful and shorter in treatment time.